Copyright © 2013 Leland Pung et al. This is an open access article distributed under the Creative Commons Attribution License, which permits unrestricted use, distribution, and reproduction in any medium, provided the original work is properly cited. Alzheimer’s disease (AD) is one of the most significant neurodegenerative disorders in terms of both severity and cost. Despite being defined over a century ago, there is currently no cure to this disease that affects an increasing elderly population. The amyloid precursor protein (APP) has been shown to play an important role in AD progression. The amyloid β peptide (Aβ), which accumulates in senile plaques, a central etiological AD factor, is a proteolytic product from APP by the enzymatic action of β- and γ-secretases. In this review, we summarize the current knowledge of the processing and physiological functions of APP, and the involvement of APP and Aβ in AD. Alzheimer’s disease (AD) is currently the most prevalent neurodegenerative disease in the world and is expected to increase exponentially as baby boomers age. Sociologically, AD presents a huge strain on caregivers who face pressures ranging from social and psychological to physical and economic. In the United States alone, AD affected an estimated 5 million people in 2007 and was expected to increase to 13 million by 2050 . 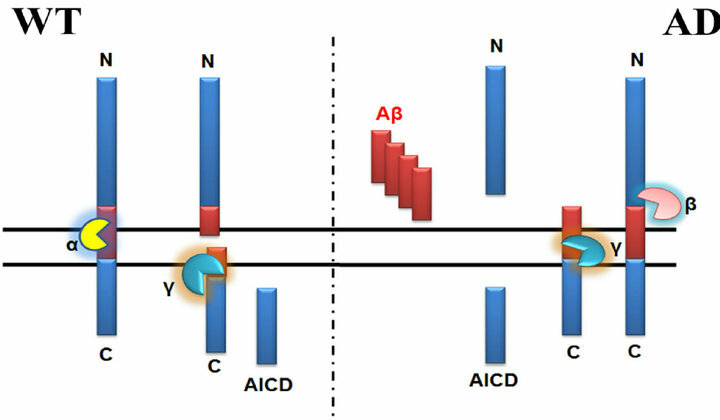 Characterized by a progressive cognitive decline leading to social and occupational debilitation, AD is pathologically differentiated from other causes of dementia by a reduction in synaptic contact , correlating with impairments of higher cognitive function in addition to the accumulation of neurofibrillary tangles [3,4], aggregates of the microtubule-associated hyper-phosphorylatedprotein tau , and extracellular senile plaques (SP) containing the amyloid β peptide (Aβ) as first discovered by Alois Alzheimer . Although senior individuals often develop some plaques and tangles as a consequence of aging, the brains of AD patients have a greater number of them in specific brain regions such as the temporal lobe . The amyloid β peptide found predominantly in the senile plaques was shown to be a 4.2 kDa peptide approximately 40 amino acids in length . It was soon verified that Aβ was cleaved from a larger precursor termed as amyloid precursor protein (APP) . APP is a highly conserved transmembrane protein with many analogues in mammalian species as well as two homologues found in invertebrates [9,10]. It belongs to a protein family that also includes two APP-like proteins, APLP1 and APLP2, in mammals [11-14]. By alternative splicing, a single APP gene generates several APP isoforms including APP695, APP750 and APP751 [15,16], most of which contain a protease inhibitor domain and are expressed ubiquitously. However, one isoform, APP- 695, is present mainly in the nervous system and lacks the protease inhibitor domain [17-19]. All members of the APP family are single-pass transmembrane proteins with a large N-terminal extracellular domain and a relative shorter intracellular C-terminus . Cleavage of APP can occur by two separate pathways through α- or β-secretase which both remove nearly the entire extracellular domain, while the membrane-anchored C-terminal fragments may trigger apoptosis . APP is subsequently cleaved by γ-secretase, a large multi-unit complex, within the membrane spanning region . While cleavage of APP by α-secretase precludes the production of Aβ, cleavage by β- and γ-secretases results in the generation of Aβ and its subsequent extracellular deposition (Figure 1). It has been shown that the pathological characteristics of autosomal dominant AD is similar to that of sporadic AD. In autosomal dominant AD, there are 32 mutations identified in APP, centered primarily around the γ-secretase cleavage site. In addition, there are 179 mutations on the presenilin 1 gene locus and 14 on the presenilin 2 gene locus, which are key components of the γ-secretases . This serves to reinforce the concept that Aβ deposition is crucial in AD development as mutations at these locations have been shown to increase the production of Aβ42, a more toxic and less soluble version of the wild type Aβ40 peptide. APP has been known to play an important role in regulating the synapse functions by modulating the synaptic transmission, plasticity, memory formation and maintenance. AD patients exhibited a decrease of synapses with the progression of the disease . In addition, APP showed a strong immunoreactivity in human neuromuscular junctions (NMJs) , suggesting a physiological role of APP in synaptic functions. Consistently, the Drosophila homologue APPL modulates the synaptic bouton number and synapse structure in NMJ , while APP/APLP2 double knockout mice show dramatic defects in the development of NMJs [26,27]. Interestingly, the conserved C-terminal motif GYENPTY of APP family members is required for synapse development from fly to mammals [25,28]. Figure 1. The Structure and Processing of APP. resulted in a defect in the fast phototaxis, which could be rescued by expressing APPL or human APP . The APP protein family also regulates development of the peripheral nervous system (PNS). Ectopic expression of APP and its homologues affect mechano-sensory organs (MSOs) development in Drosophila, which resembles Notch gain-of-function phenotype . This function of APP depends on the NPTY motif in the AICD domain, and is mediated by Numb and Dab . AD patients have shown cerebral amyloid angiopathy with deposition of Aβ peptides in the walls of leptomeningeal, cortical arterioles, endothelial cells, smooth muscle cells, adventitial cells and brain pericytes and/or perivascular cells . The deposits, a result of impaired clearance of parenchymal Aβ peptides, will lead to inhibition of angiogenesis, resting hypoperfusion and decreased vascular density [37-40]. Thus, clinical therapies targeting cerebrovascular amyloid angiopathy clearance might provide a potential cure for AD . APP has been shown to modulate cell growth, motility, neurite outgrowth and cell survival in transfected cell lines . An in vivo study showed that rodents injected APP RNAi developed neuronal migration abnormalities . These functions can be reproduced by the soluble extracellular domain of APP that contains two heparinbinding regions . Recently, the APP extracellular domain was shown to act as a ligand for Death Receptor 6, thus activating caspase 3- triggered cell body apoptotic degeneration and caspase 6- triggered axonal degeneration . The C-terminal intracellular domain of APP (APP intracellular domain, AICD) was also shown to be important by serving as a transcriptional regulator . In addition, the highly conserved YENPTY motif found in AICD is crucially required for the internalization of clathrin-coated pit , and thus, modulates the endocytosis and intracellular sorting of APP  and Aβ production . Despite the enhanced concentration of Aβ production, a subsequent increase in either APP expression or Aβ production has not been reported in patients with sporadic or late onset AD. The concentration of Aβ in the brain thus depends on a maintained balance between its production, influx across the blood brain barrier and clearance from the brain into circulation. While soluble Aβ can be removed from the brain via interstitial fluid bulk flow, this accounts for the removal of only 10% - 15% of the total Aβ within the brain. In addition, the bulk flow of ISF is also responsible for influx of Aβ into the brain from plasma. Recently, receptor mediated Aβ transport has become an important part of the mechanism of Aβ clearance, with several receptors playing key roles . Loss of function of low density lipoprotein receptorrelated protein (LRP) has been implicated in decreased Aβ clearance in mice and has been genetically linked in epidemiological studies to AD pathogenesis [51, 52]. LRP expression has also been shown to be repressed by increased Aβ levels, which might contribute to the observation that LRP activity in the brain of AD patients is low . Another molecule, ATP-binding cassette transporter p-glycoprotein (p-gp) has also been shown to be inversely correlated with the increase of Aβ in AD patients, suggesting its role as a mediator of Aβ efflux . Cells with receptor for advanced glycation end products (RAGE) have been shown to assist in the transport of Aβ across the blood to the brain, in apposition to LRP and p-gp . Studies have indicated that RAGE expression is up-regulated by extracellular Aβ in the AD brain, suggesting that these interactions exacerbate AD pathology . Degradation of Aβ through enzymatic processes also plays an important role in the removal of Aβ from the brain. Neprilysin, an Aβ degrading enzyme in the brain, is extracellularly exposed to sites of Aβ deposits. While expression of neprilysin decreases in the cortex and hippocampus of AD brains , transgenic expression of human intracellular neprilysin was able to drastically reduce amyloid deposits in mice [56,58]. Insulin-degrading enzyme (IDE) was also shown to influence the clearance of Aβ in AD patients. In animal studies, impairment of IDE resulted in decreased Aβ degradation, while overexpression of IDE was able to reduce extracellular Aβ levels and completely prevent the formation of amyloid plaque [58,59]. The role of APP has been primarily focused on the toxicity of Aβ since this peptide was found to be accumulated in the senile plaques . Aβ was shown to be neurotoxic , probably through apoptosis triggered by Aβ oxidation . Mice overexpressing mutant human APP quickly developed Aβ plaques and elicited loss of synaptic contact, infections and decreased spatial memory. This is accompanied by release of caspases, including caspase 3, 6, 7, 8, and 9 [63-66]. Caspase induced damage in AD may occur independent of apoptosis, as APP itself is a target of caspase cleavage and produces a potentially toxic intracellular C-terminal fragment [67, 68]. Controversy has arisen over the toxicities of intracellular versus extracellular Aβ, as intracellular Aβ is seen early in AD. Consistently, intracellular injection of Aβ42, but not Aβ40, resulted in neuronal apoptosis . Soluble Aβ has been shown to activate GSK3β and cdk5, two kinases that regulate tau phosphorylation in generating neurofibrillary tangles. In addition, cleavage of tau was shown to be regulated by Aβ through activation of GSK3β, caspase 3 and 9 as well as calpain [70,71]. Consistently, tau appeared to play an important downstream regulatory role in the Aβ toxicity, as transgenic mice overexpressing APP, but lacking endogenous tau, failed to display the loss of spatial memory phenotype despite an abundance of Aβ . Although the neuronal toxicity of accumulated Aβ in the brain has been well documented, its pathological role in AD progression has remained unresolved. Firstly, removal of APP, and thus, Aβ production in mice did not prove beneficial to adults. Secondly, though clearance of amyloid plaques in AD patients was achieved in a clinical study using an active immunization protocol against Aβ42 peptide, this clearance did not prevent progressive neurodegeneration . Finally, peripheral injection of Aβ peptides in an experimental autoimmune encephalomyelitis (EAE) animal model suppressed inflammation in lymphoid tissues, which further led to reduced brain inflammation and delayed occurrence of motor paralysis, suggest a neuroprotective effect of Aβ peptides in autoimmune diseases . Despite the many challenges, significant progress has been made in understanding the progression of AD. While the pathological roles of APP in AD development have not been fully understood, by examining in more detail the molecular process through which APP and Aβ peptides affect neuronal development and death, new drugs could possibly be developed targeting these pathways. This study was supported by the program for new century excellent talents in university (Grant No. NCET-10-0608) and the specialized research fund for the doctoral program (Grant No. 20120072110023) from the Ministry of Education of China. Trojanowski, J.Q. and Lee, V.M. (1994) Paired helical filament tau in Alzheimer’s disease. The kinase connection. The American Journal of Pathology, 144, 449-453. Torroja, L., Packard, M., Gorczyca, M., White, K. and Budnik, V. (1999) The Drosophila β-amyloid precursor protein homolog promotes synapse differentiation at the neuromuscular junction. The Journal of Neuroscience, 19, 7793-7803. Chen, W.J., Goldstein, J.L. and Brown, M.S. (1990) NPXY, a sequence often found in cytoplasmic tails, is required for coated pit-mediated internalization of the low density lipoprotein receptor. The Journal of Biological Chemistry, 265, 3116-3123. Crossgrove, J.S. et al. (2005) The choroid plexus removes β-amyloid from braincerebrospinal ﬂuid. Experimental Biology and Medicine (Maywood), 230, 771-776. Marr, R.A. et al. (2003) Neprilysin gene transfer reduces human amyloid pathology in transgenic mice. The Journal of Neuroscience, 23, 1992-1996. Irizarry, M.C., Soriano, F., McNamara, M., Page, K.J., Schenk, D., Games, D. and Hyman, B.T. (1997) Aβ deposition is associated with neuropil changes, but not with overt neuronal loss in the human amyloid precursor protein V717F (PDAPP) transgenic mouse. The Journal of Neuroscience, 17, 7053-7059. Grant, J.L., Ghosn, E.E., Axtell, R.C., Herges, K., Kuipers, H.F., Woodling, N.S., Andreasson, K., Herzenberg, L.A. and Steinman, L. (2012) Reversal of paralysis and reduced inflammation from peripheral administration of β-amyloid in TH1 and TH17 versions of experimental autoimmune encephalomyelitis. Science Translational Medicine, 4, 145ra105.